Find Justine’s WordPress Blog at JZ (you will have to “request access” because her blog is set to “private”). I understand that some of our current first year literature students had Justine as a teacher last year and arrive at ACU with well honed Web 2.0 skills! I am a third year out teacher who studied a BT/BA (Literature) at ACU. I graduated in 2009 and have decided to use this page as a record of my professional development. My first experiences with blogging go back to 2005, where Associate Professor Michael Griffith introduced us to a similar blogging site called Livejournal. The experience was incredibly daunting, however I don’t think I would be the teacher I am today if I hadn’t been subjected to such a rewarding challenge. I currently use Livejournal to record my year 12 HSC journey. The students access this site and have a written record of all content taught and learnt. The feedback from them has been amazing. I will use this site to record all of my challenges, and I am happy to help anyone who is interested in hearing about what to expect as a newly graduated teacher from ACU. I currently teach at St. Agnes Catholic and Loyola Senior High School (Dual campus school). Feel free to share! My school is incredibly supportive and the executive team encourage us to share and collaborate with other members in the profession. 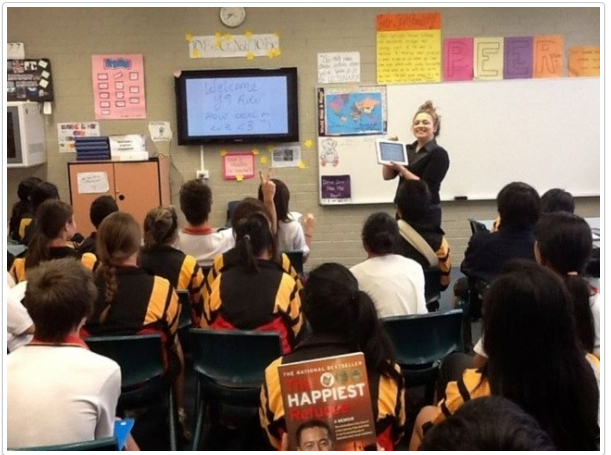 The great thing about my Year 12 LJ is that every single student can access it either on their smart phones, tablets or computers. My HSC students have access to all content outside of the classroom at a time that suits them, which in turn makes it more relevant to them because they have chosen when they wanted to access it. In fact, I was asked to share my Livejournal setup with the English department at a staff meeting two weeks ago because our coordinator heard positive feedback from the students in the playground. She was very interested and asked me to share my experiences with blogging. I commented on how I used this tool as a student at ACU and that is where it stemmed from. They were very impressed… How’s that for positive feedback! You certainly are a ‘lead’er MG! http://www.hbe.com.au/conference.html – check it out. I will attend a number of technology sessions during this weekend. I shared your Pencil Metaphor with a group of English teachers- it’s fantastic and very true.